Kreitler and others (1983) did not include the raw data they used to analyze the hydraulic pressure regime in the East Texas basin because those data were proprietary drill-stem tests and scout cards from Petroleum Information Corporation. They also alluded to the relatively low quality of the data. However, because their analysis of the data is the only pressure data that we found for the Paluxy formation, we have included that analysis in this report. 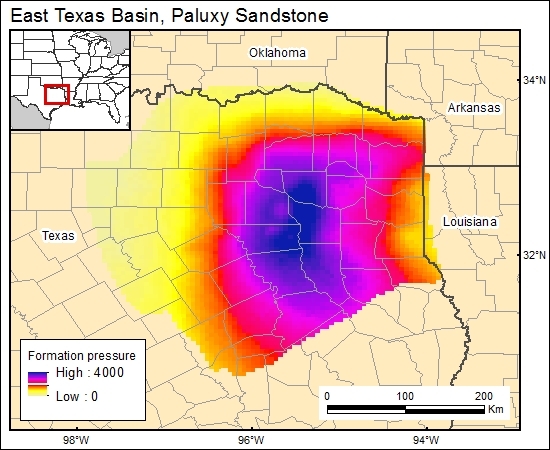 Kreitler and others (1983) concluded from the pressure (proprietary data not available from Kreitler's report) and water chemistry data that the Paluxy is a "mixing zone for the Upper Cretaceous hydrologic system and the deeper saline system. The depth of the Paluxy pressure data is" the point on the graph "where the pressure/depth slope starts rising above the brine hydrostatic" (Kreitler and others, 1983, p. 105).